How'd it get to be half-term so soon? Barely five minutes since the last one. With an impromptu day off, had kind of sort of possibly planned a family friendly lunchtime outing, then learned that (a) Eldest was in town with a mate, (b) Middler had a mate coming round, and (c) The Boy was out for a day trip with that Nana. Cool beans. Come on, Wifey, we're off. Out past Hintlesham and Hadleigh and into the Lovejoy land of Lavenham and beyond to scratch an itch. See, at Jimmy's Harvest, we had some fantastic coffees -- lattes, long and hot -- from one of the numerous catering stands. 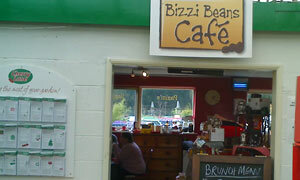 I took away the drinks and their card; chap was from a cafe in Long Melford by the name of Bizzi Beans. Must go there, we said, and here we are, true to our caffeinated word. Had assumed they had standalone premises. Not so: they're situated near Melford Hall in a garden centre (hello, Wyevale) named Cherry Lane. Put me off a bit, if I'm honest. However, walking away from the Weedol and kneelers and into their enclosed area is akin to Mr Benn walking out of his changing room and finding himself in a different world. Could be the fabric-covered seats, or the wooden block trivets, or the rows of Jussy's Jams, or the huge cakes. You'll exhale, de-stress and say to yourself, This Is Nice. No menus: you order from the compact kitchen end with the nifty blackboard doored cupboards. Soup, sandwiches, jackets, the usual. Panini for her -- vg with colourful side salad -- and "mini breakfast" for me -- that'll be a good size beans on toast with egg and sausage. Quality branded condiments, welcome back. They're big on brunch at Bizzi's. Plus WiFi and colouring: shame that kids aren't here. Not. Return to the counter for the main event: coffee. With cake. Main guy is obviously busy on the phone yet still manages to make our drinks, mostly one-handed. Like a proper barista, he takes a lot of care pouring the hot milk over the espresso, and somehow creates one of the best cups of coffee I've ever had. Comradely slice of Victoria sponge is the size of a small land mass. Only tension in the room is from the array of garden implements artfully secured to the walls. Careful with that hoe, Eugene. If they were passing by -- Ralph Fiennes.